We all love our morning brew. It is difficult to imagine a single day without it. But little do we think or know about the process of how the heavenly smelling coffee beans are grown, harvested, processed or ground. 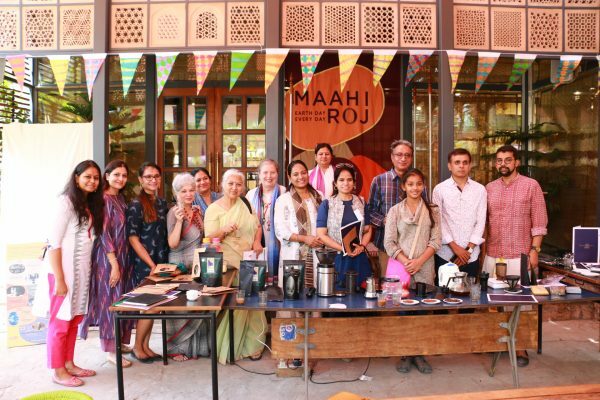 With the aim to acquaint Jaipurites about the nuances of coffee brewing and tasting, a food and beverage consultant community of Jaipur– ‘Tryst With Taste’ – conducted a workshop at an event — Maahi Roj. 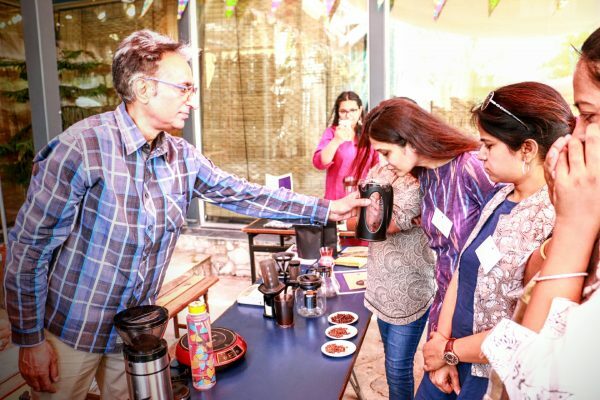 With live demonstrations of brewing, specimens of different roasts of beans, coffee tasting and some insightful tips on how to get that brew right, the founder of Tryst with Taste – Ayesha Sajjan along with her father led the attendees of the workshop on a divine coffee journey. 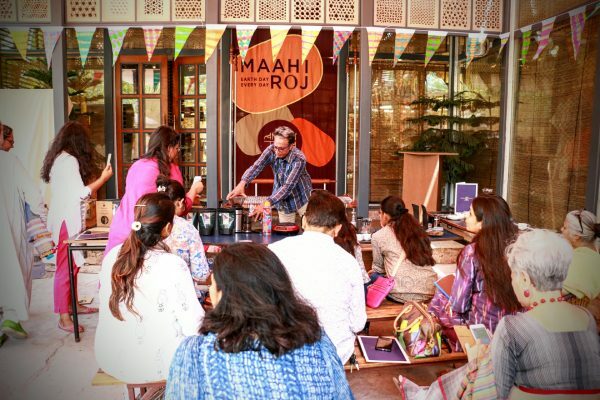 From planting a coffee bean to pouring it right in a cup, the coffee brewing and tasting workshop shed light on it all. Let me take you through the glimpses of the workshop. 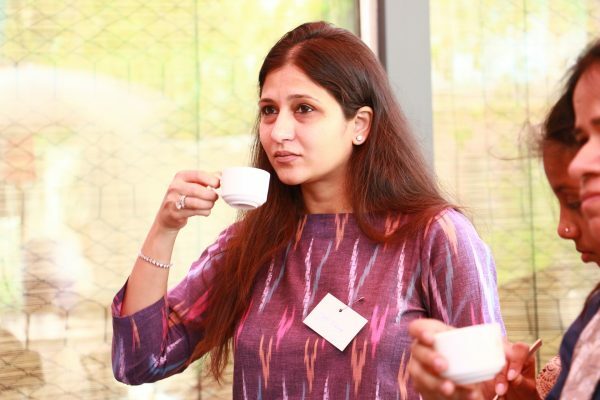 The tea-addict-turned-coffee-expert, Ayesha explained that a coffee bean is actually a seed. When dried, roasted and ground, it is used to brew coffee. And if the seed is not processed, it can be planted and grown into a coffee tree. Depending on the variety, it takes approximately 3 to 4 years for the newly planted coffee trees to bear is ripe and ready to be harvested. Once the coffee has been picked, processing must begin as quickly as possible to prevent fruit spoilage. Coffee is processed either using the dry method or the wet method. The former is the age old method of processing coffee and used in countries where water resources are limited. After drying and milling, the coffee is repeatedly tested for quality and taste. This process is referred to as cupping and usually takes place in a room specifically designed to facilitate the process. The flavor and aroma of the coffee one drinks depends on the process of roasting and in order to get the most flavor in a cup of coffee, it s essential that it is ground properly. Next comes the process of coffee brewing. 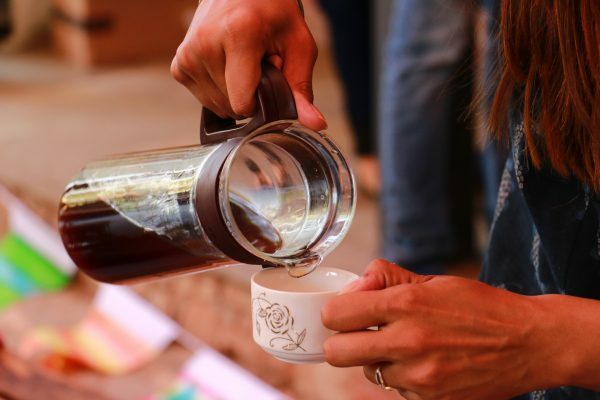 While the right way to make coffee is how you like it best, there are a few fundamentals that will help one perfect the technique of coffee brewing. Freshly roasted coffee is essential to a quality cup and thus one should purchase coffee as soon as possible after it is roasted. It is advisable to buy coffee in small amounts. The coffee enthusiasts were also cautioned against making the common mistake of storing the coffee in a refrigerator. Even though great coffee starts with great beans, the quality of water used to make the coffee is of paramount importance as well, pointed, out Ayesha. It is advisable to use bottled water instead of RO water because of the lack of minerals in the latter. In fact, water from natural resources is the best for making coffee. Similarly, the coffee to water ratio is also equally important. A general guideline is called the “Golden Ratio”, which is one to two tablespoons of ground coffee for every six ounces of water. However, this can be adjusted depending on one’s individual taste. One should also be careful about the temperature of the water. It should be allowed to come to full boil but should not be over boiled. Lastly, one should make only as much coffee as one intends to drink at a point because prepared coffee begins to lose its optimal taste after brewing. 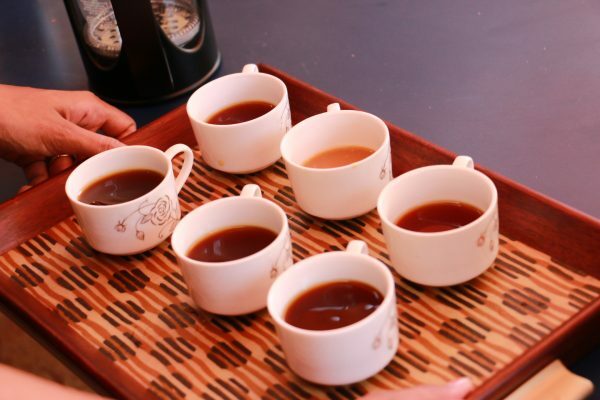 And do not forget to imbibe the aroma and flavours of the coffee as you sip it. Many people have been instrumental in bringing it to your cup. PreviousPrevious post:Food Review: Have a good time at ‘The Good Times Cafe’NextNext post:Food Review: Craving for a beer? Head to beerlicious!